The civilization of Greece laid the scientific temper in the whole of Europe. Not only this, it gave the idea of government and rules of governing to the whole world. It laid foundation for philosophical pursuit for human development. Even today people quote Socrates, Aristotle and Plato. The world was in a way expanded by Greece when Alexander invaded India, thousands of miles away. The Indian civilization and Greek civilization were prime motivators for human development in ancient world. Infact it is said, when Alexander went back from India, he invited a few Indian scholars to integrate in Greek society and expand its vision. It is generally, said history is confined to geographical limits of a country. But Greek history wiped out of geography altogether. Cleopatra supposed to be the most beautiful women ever born on earth was a Greek lady who ruled Egypt. Ptolemy and Pythagoras the great mathematicians lived in Egypt, defying geography the system of density and specific gravity was discovered by Archemedis of Greece. The medical doctors passing out anywhere in the world even today take Hippocracic oath in the name of Hippocrates the great physician from Greece. Greece and Latin are mother languages for all European languages. 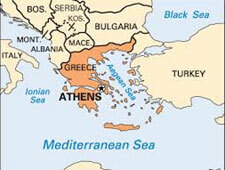 There are several islands alround Greece which are part of Greece. Infact Christianity is supposed to have spread from Cyprus now an Independent country, between Greece and Turkey. There is a famous story by name of Helen of Troy. Helen of Troy was kidnapped by another king from Greece and epic story came out of this akin to Ramayana in India. In Ramayan the kidnapper was killed by Sita’s husband and Sita was retrieved. However in the Greece story the kidnapped lady married kidnapper. The term Trojan horse is all too familiar to almost everybody in the world. In the Trojan war the schemer from Troy leaves a huge wooden horse in the battle field and retrieves to his camp. The enemy army sees this as a trophy and takes it and presents it to the king. In the night soldiers cameout of the horse and break open the fort gates so that Troy soldiers enter into the fort and win the war. The name of the scheemer was Ulysses. Ulysses was a travel buff. He travelled all over the world and recorded the events from far off places and enriched the Greek literature. Olympic games have started in the late 19th century in the world. These games were supposed to have been played in the bygone history of Greece. How much we can tell of Greece? Whatever we say it is still inadequate and lot more remains yet. In the present day discovery of any new metal or element or biological plant its name is given either in Greece or Latin. This is the homage we pay to the ancient Greek civilization. Today maximum revenue for Greece comes from tourism. One can imagine how even today people are pulled to Greece.